The police on Saturday arrested a gang of 10 persons belonging to Mettur in Salem district for allegedly abducting a Coimbatore based businessman for ransom. A special team on Saturday stormed into a hideout in Usiparai mountain in Mettur and arrested P. Raja (25), A. Karthik (28), A. Raja (26), N. Thiagarajan (26), M. Mohan alias Chandramohan (34), G.K. Raja (37), T. Kayalan (36), M. Sekhar (35), D. Balaji (26) and R. Mahesh (44). 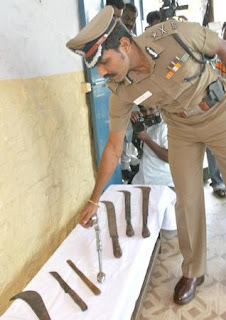 Sickles, knife and weapons were recovered from them. City Police Commissioner C. Sylendra Babu told reporters that Subash (53), a real estate businessman at Race Course along with his friend Ravindaran (64) went to Salem for purchasing property on April 9 and never returned home. Following a complaint filed later, a case of man missing was registered at Race Course police station. A special team under Deputy Commissioner of Police (Law and Order) E.S. Uma was formed with members including, Inspector T.H. Ganesh, Sub Inspectors C. Rajkumar, Prabhudas, Sakthivel, Saminathan, Karuppusamy, Selvam along with a posse of commando trained police personnel arrested the accused. Under the pretext of helping them to find land, Kumar, a local person there took them to a house in Mettur. They were beaten up by a gang of ten persons and allegedly demanded Rs.5 lakh for their release. Hence, a ransom of Rs.2 lakh was allegedly paid to them by Ravindran's friend and they were released on April 11. The gang also took away 18 sovereigns of jewels from Ravindran. One of the injured hostages got admitted to a hospital for treatment. Investigations reveal that the gang was involved in murder, abduction, rice smuggling, illegal arbitration since 2001 and had served imprisonment. Police are on the look out for Balaji, Bharathi and other group members who were absconding. Special teams have fanned out in search of the remaining accused. Cases were registered against the accused under Indian Penal Code for unlawful assembly, abduction, wrongful confinement, attempts to murder, conspiracy and criminal intimidation. They were remanded to judicial custody.